Lulu Guinness OBE famous for exquisite, witty handbags and accessories, launched her company in 1989 and instantly became a “must” in every fashion aficionado’s international address book. Wild praise in the fashion media paved the way for Lulu Guinness shops in London, New York and Tokyo. Her unique creations are also sold in department and specialty stores worldwide, including Harrods, Selfridges and Fortnum and Mason in the UK. Brown Thomas in Ireland and Lane Crawford in Hong Kong. All Lulu Guinness stores are designed by Lulu herself and provide the perfect showcase for the entire range of accessories. Lulu’s collectable bags have been described as ‘tomorrow’s treasures’ and have become permanent fixtures in many museums. The Florist Basket and the Violet Hanging Basket are just two of the designs that have been included in the permanent fashion collection at the Victoria and Albert Museum, London. They have also been subjects of two exhibitions in Sotheby’s London and New York. Meanwhile her bags are seen on the arms of an ever-expanding list of celebrities, amongst them are Dita von Teese, Helena Bonham Carter, Katy Perry, Sophie Dahl, Rachel Weisz, Keira Knightley, Sienna Miller, Agyness Deyn, Alexa Chung. Despite her success Lulu has never had any formal design training apart from a year’s foundation course at art school and a long-standing passion for design and fashion. In 1989, she left her job in video production to start her own business from the basement of the house in west London. Lulu’s strong personal style and her original ideas have played a large part in her success with her design inspiration springing partly from retro glamour and partly from modern chic. In 2006, Lulu was presented an OBE from the Queen. 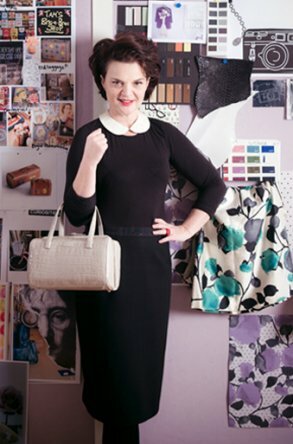 In 2009, Lulu Guinness was awarded The Independent Handbag Designer Awards ICONOCLAST Award for Lifetime Achievement in Handbag Design. This year saw Lulu awarded an Honorary Doctorate by The University of the Arts London.